In continuing my illustration series following the Molecule of the Month over at the Protein Data Bank (1), this month I created an image showing the nucleocapsid of the measles virus. I'm sure you've heard of measles before. In fact, it seems to be a bit of an ongoing newsworthy item now and again. Measles is caused by a virus that is extremely contagious and can be deadly (2). Fortunately, we have a widely available vaccine (typically administered together with protection against mumps, rubella, and sometimes varicella (3)) to prevent the spread of this illness. 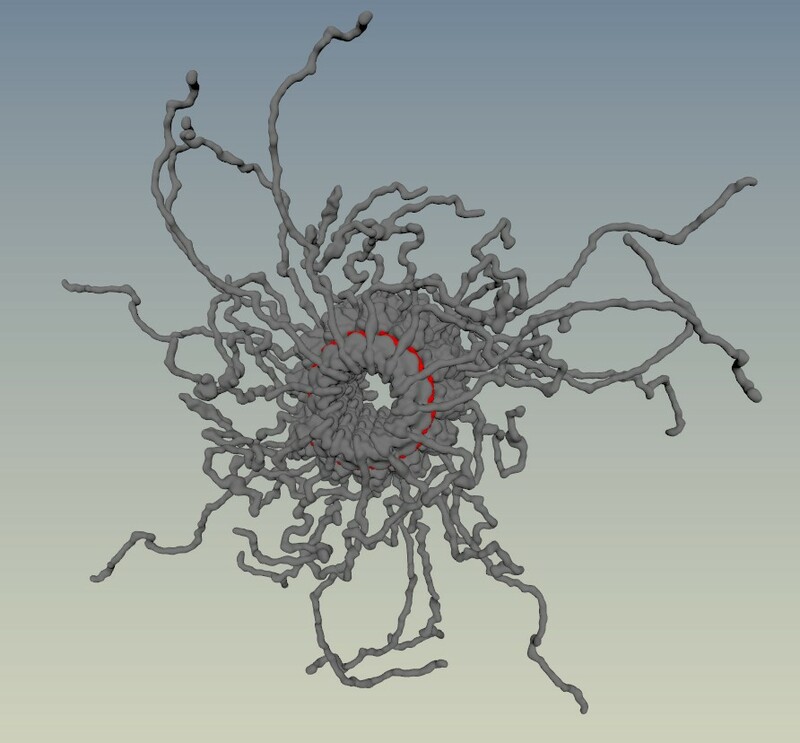 This image doesn't show the entire virus, instead it focuses on the genetic material (RNA in red) and the protein coat (grey) that protects the viral genes from our bodies' natural defenses (4) and also plays a role in helping the virus make copies of itself through transcription and RNA replication (5). I spent a long time looking at the proteins amazingly illustrated by David Goodsell on the RCSB website, and wondering how I might create an illustration of my own. I liked the idea of the long repetitive pattern of the nucleocapsid. When I did some more research, I realized that a long flexible tail was omitted from the structural data (4) and the close-up illustration of the nucleocapsid. Working with my recent method (explained in this YouTube tutorial) I decided to append the flexible tail to the existing data and create something (hopefully) striking. Although the tail originates toward the hollow space in the center of the complex, there is evidence that the tail feeds itself back toward the outside (there's also space limitations with stuffing it all inside), resulting in an external coat of long flexible fibers (6,7). Once I had that piece in place, it became clear that I could create something quite menacing, using visual inspiration from the Sentinels in The Matrix (which is 20 years old this month!) (8). This approach did have some technical and visual challenges to work out. 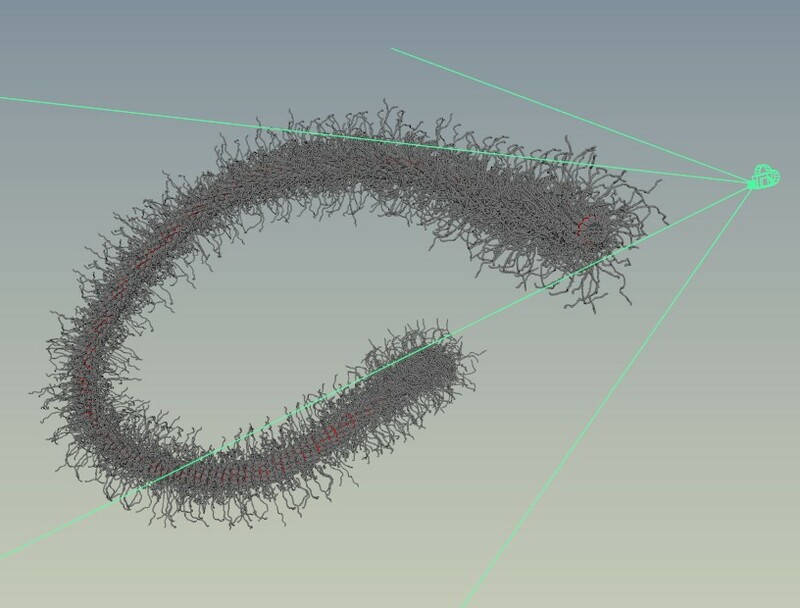 Instead of making 2,516 copies (9) of the nucleoprotein and simulating all of them individually, I decided to simulate a lower number of copies and create static meshes that could be randomly scattered along the length of the nucleocapsid. I figured out the correct transformation offsets I would need to spiral the copies correctly, and used MASH to create a single unit of 37 proteins. 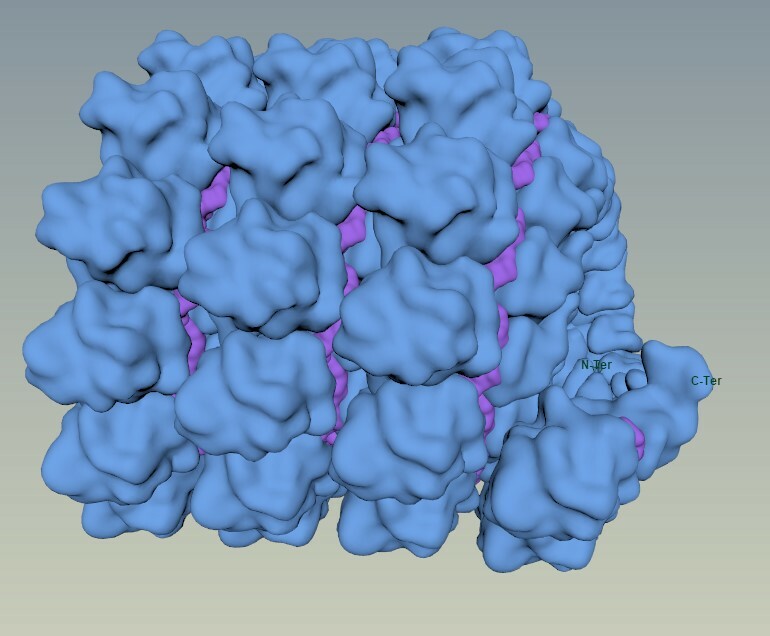 Side note: Yes, although I'm learning Houdini, I did use Maya for this illustration because I already know the tools well and I have yet to figure out a pipeline for getting molecular data directly into Houdini. 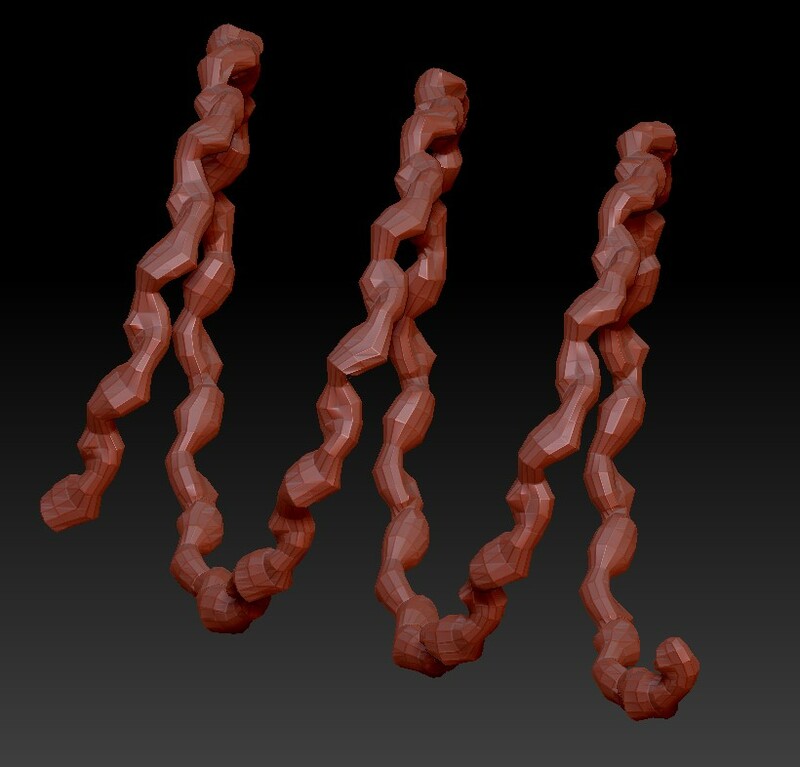 Then I adjusted the random seed to make several more 37-monomer "units", and sent them over to ZBrush for some retoplogy to reduce the mesh density for all the background units. I also made a lower-resolution RNA spiral unit. Tip: After retopology of thin meshes, use the 3D Gizmo and ctrl+drag the yellow center to inflate the model closer to the original volume. Turns out the RNA is all cytosine residues… so not perfectly accurate… shhh! Finally, I used MASH again to spread the units along a curve, and posed the whole assembly to my liking. I believe this is approximately the correct full length of the measles genome, and yes it should fit inside a typical measles capsid. Successful assembly! I feel like the RNA is the most central and dangerous aspect of this virus, so I wanted all of the color in the image to come from that and have it draw the eye. Because of how the protein binds to the RNA, I didn't get as clean a view of the RNA helix as I was hoping, but I think overall the image works as intended. I hope you like it. Gutsche, I. et al. Near-atomic cryo-EM structure of the helical measles virus nucleocapsid. Science 348, 704–707 (2015). Jiang, Y., Qin, Y. & Chen, M. Host–Pathogen Interactions in Measles Virus Replication and Anti-Viral Immunity. Viruses 8, (2016). Jensen, M. R. et al. Intrinsic disorder in measles virus nucleocapsids. Proc. Natl. Acad. Sci. U. S. A. 108, 9839–9844 (2011). Desfosses, A., Goret, G., Farias Estrozi, L., Ruigrok, R. W. H. & Gutsche, I. Nucleoprotein-RNA Orientation in the Measles Virus Nucleocapsid by Three-Dimensional Electron Microscopy. J. Virol. 85, 1391–1395 (2011). The Wachowski Brothers. The Matrix. (1999). Lund, G. A., Tyrrell, D. L., Bradley, R. D. & Scraba, D. G. The molecular length of measles virus RNA and the structural organization of measles nucleocapsids. J. Gen. Virol. 65 ( Pt 9), 1535–1542 (1984).